I recently setup a new computer for a friend, who’s win98 computer had broken some time ago. Purchased a really cheap new PC, dual core E5300 cpu, 2GB ram, on board everything, with sata disk and dvd writer, plus an 18.5 inch screen, came out to $630 NZD. Now, I had the difficult call to make, as to Mandriva or Ubuntu, because Ubuntu is very popular in NZ so he might be able to get better community support for it, and their are local mirrors for updates. Anyway, decided that it was going to be Mandriva x86_64, 2010.0 with KDE 4.3, because I know it well and because is has some tools I planned on using. He received the machine today and was rapped. Plugged his printer in and it just worked!.. and they even got imap with kmail configured without my help. Now, I usually configure systems for myself, but this was for a real beginner, so I needed to keep things simple and make it easy for him, so I made a few changes to the configuration, however discovered some things that I think need improvement along the way. First thing was, I installed Mandriva 2010.0 Free, then had to add in a bunch of commercial apps, because you can’t expect a beginner user to go without them or install them himself.. The most notable was Flash Player, I think this should be easier to get, for 2010.0 free. It’s in PLF, but only in the i586 repo, and beginners are not even going to know about PLF. So, my point here is, since it ships with Mandriva one, should be easy to get for Mandriva Free 2010.0 users. Also installed Skype, Picasa and Google Earth and the necessary codecs to play DVDs, mp3, movies, etc. No packages available for the Google apps so had to install them by downloading the installers from Google. Next, thought I’d fire up Transfugdrake and pull the configurations from his old hard drive, plugged in via USB. Not so easy, I ended up having to hack the source code in /usr/lib/libDrakX/transfugdrake.pm to even get it to look at the disk. It should be able to be pointed at a mount point, and told to run.. without having to rely on the auto detection, which did not work at all in my case. Transfugdrake did import some bookmarks, and the wall paper, plus some documents, although it missed all his documents that were on the desktop in windows. So, some thoughts around transfugdrake is…. it needs some improvements and a lot of testing! It also found his email address, but didn’t import it into anything useful in KDE4.3. Next I tried to make life simpler for him, so did things like, reduced the number of desktops, added applications to the bottom panel, configured updates, added a link to the documentation, added him to the wheel group and configured sudo. I wanted passwordless login, so I ran systemsettings as root, then configured KDM to auto-login and to not require passwords if he logged out. Pity this method of configuring auto-login is hidden for the average user. Next I fired up Amarok, and discovered it wanted to use kwallet.. even when I had not entered any passwords for Amarok. The Last-fm plugin seems to want to open kwallet, even when it’s not storing a password… this brought me to the next thing, which was I wondered if it was possible to make kwallet not require a password for the default wallet. I could not find a way to do this, so ended up just turning off kwallet to keep in simple. Next was making the configuration tools easy to get to. I set most things in the Mandriva authentication settings to not require a password, but could not find a way to allow access to drakconf without a password, so a quick edit of the .desktop file to run sudo drakconf fixed the problem nicely. Maybe drakconf should try sudo, if the user can use sudo to run it, then use sudo instead of always requesting the root password.. This would make it easier for users, and is no less secure. Next was backups, as I remembered drakbackup… however, found draksnapshot, which is even nicer. I created a ext4 partition on his old hard drive and used that for the backups with draksnapshot. It’s nice, but configuration is too simple, and, although it works, it runs on cron, so the user can’t trigger a backup, and it will only do daily backups at 4am by default.. So, was kindof limiting. I reconfigured cron to run the daily backups at a time he might be using the computer, then explained how it works. It would be good if the user could trigger a backup when the backup media is added. This kind of makes sense because draksnapshot initially prompted to use the media for backups in the first place. I think using rsnapshot is smart, efficient and makes recovery easy, but think we need to work on improving the user interface of draksnapshot… Looking at the Ubuntu solution, of SimpleBackupSuite, it has many more options to control the backup.. Now, sbackup could be packaged for Mandriva, but it creates tar based backups, similar to drakbackup, which don’t seem as good to me as using rsnapshot. anyway, a happy user, and looks like another couple of Mandriva converts. 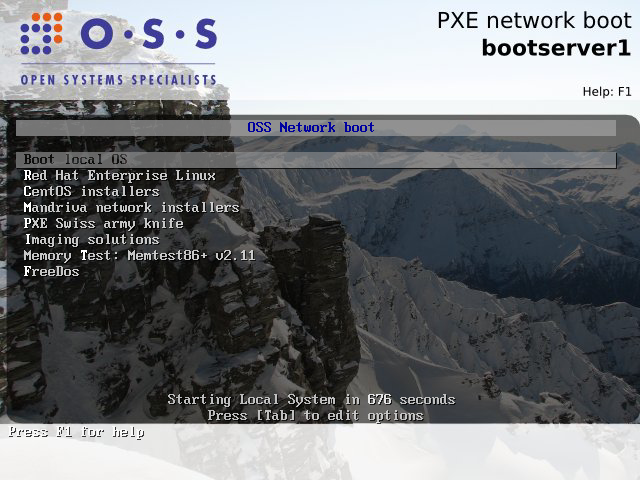 I recently setup a demo machine for a presentation on pxe boot, where I wanted people to be able to login and have a look around a demo pxe boot VM. Lots of ways to do this, but the way I wanted to make this work was via ssh, without requesting a password. then I just add users, and put them in the demo group if I want them to login without a password.. neat. Mandriva has a fairly good tool for building and managing pxe configuration. It’s called drakpxelinux. This is the tool that got me started with network booting and although it has some fairly rough edges, worked fairly well. After exploring some more, I discovered that pxelinux, part of the syslinux package can do much more than people traditionally use it for.. This includes graphics, multiple boot options and menus, context and general help text and passwords and ability to change kernel options. A screenshot below is an example of what we now use at work for the default menu. This really makes things a lot easier to use and looks quite professional. Memtest86 and PXEKnife, which includes some basic Linux flavors, firmware updating tools, password reset tools, disk wiping and other random stuff. I am wondering about adding a “Graphics” option into drakpxelinux which would allow people using drakpxelinux to configure a graphical boot menu, probally using a couple of templates and allow them to incorporate their company logo. I am also thinking it might be nice to provide a package that contains a bunch of common pxe tools and configurations. I am Interested in this, because I am also interested in making a better way to network boot Mandriva to run it diskless. I might see if I can get some help with some of it, as have limited perl skills, although the code not looking too tricky from my breif inspection. Anyone interested in my sample configurations, can get them here. DHCP and tftpd configuration is mostly standard for pxe setups, let drakpxelinux configure it for you, although you will need to point to pxelinux.0 rather than linux.0 in the dhcpd.conf file. Boot rescue mode from a Mandriva CD. edit ../grub/menu.1st to use your the new initrd-new.img file. Also turn off graphical boot. I am trying to help make Mandriva 2009.1 one of the best ever Mandriva releases, however I am having a little bit of a frustrating time getting responses from the Mandriva cooker team. I have to say that most of 2009.1 looks fantastic, great work with the msec changes, KDE 4.2 and a bunch of other really nice touches. I love the wallpaper! I know everyone is busy working on 2009.1, but getting no response when I send patches to package maintainers is a bit disheartening, especially when I would like to see the patches get into 2009.1. Likewise, bugs that I logged, even some bugs that I logged back for 2009.0 have not been updated, they just still sit there, usually triaged as valid, but no action or updates, yet they are not the kind of just cosmetic bug, they are a feature is unusable bug! I wonder what I can do to help, when by the looks of things, supplying patches that fix valid bugs, and logging bugs, sometimes just gets no response. I do get a response sometimes, so don’t take this the wrong way. I just want to get some bugs fixed. Bugs that would be easy to fix and are visible to users are not look good I think. I currently have 8 bugs logged, 6 of which have patches or solutions in the bug report, just not applied. Tonight I’ve been doing a few tests on Mandriva 2009.1 RC1, x86_64 inside vmware and logging / voting on bugs where things in the installer don’t work. Mostly around encryption.